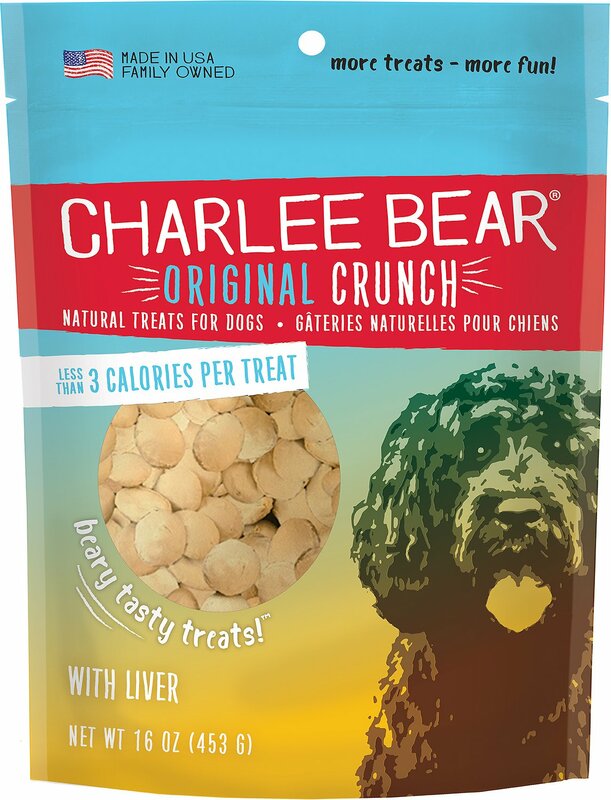 Give your dog the flavor-packed, natural taste of home with Charlee Bear Liver Flavor Dog Treats. They're made with real, wholesome ingredients, just like mom's homemade biscuits! Great for small dogs, large dogs and all dogs in between, you can use them to treat your dog anytime—whether you're congratulating them for great behavior or just saying, "I love you!" Plus, they're perfect for training because they're stain, smell, and grease free—which makes them pocket perfect, so you can be ready to reward anytime. Made with real, wholesome ingredients with real, wholesome benefits like natural protein and fiber. All-natural means nothing artificial—treat your pup guiltlessly, without any artificial colors or flavors. Low-fat treats are only 3 calories per treat, so they won't disrupt your pup's diet. Pocket perfect: no stains, no smells, no grease and no crumbs! Made in the USA with ingredients you can trust. Wheat Flour, Liver (Poultry Liver Preserved Naturally with Vitamin E), Salt (2 Tablespoons Per 100 Pounds), Garlic Powder. The low calorie count of each Charlee Bear treat means you can treat your dog often throughout the day. The exact number of treats a dog should eat in a day depends on the size of the dog, the breed, the current activity level and whether or not the dog is currently overweight. Work with your vet to determine an ideal weight for your dog. You can use low calorie Charlee Bear Treats instead of high calorie rewards to provide a way to reduce calories and still keep the fun of rewarding and training. Please store in a cool dry place after opening. Where do you manufacture your treats? 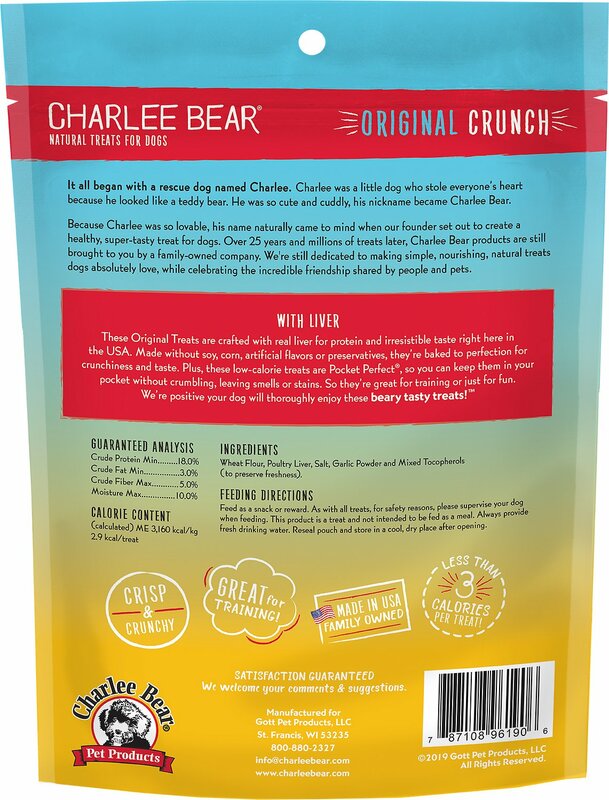 Our Charlee Bear Dog Treats are manufactured in the USA. Our goal is to provide the most wholesome, delicious treats that your dog will love. Can puppies eat Charlee Bear treats? Puppies come in many different sizes and temperaments. It is important for you to use your good judgment and understand your puppy. If your puppy is old enough to chew and swallow kibble our treats should be fine. It is always important to observe your puppy when giving a treat to see if he/she is chewing and swallowing properly. When puppies are overly excited they may forget to chew. In an excited state any puppy could gulp something without chewing and cause choking so pet parents should be aware of potential problems. We would suggest waiting until at least 12 weeks of age before using any type of treat, and consulting with your veterinarian about appropriate treats for the specific breed, size and age of your puppy. Can old dogs eat Charlee Bears? Many old dogs love Charlee Bears because they are easy to chew and our simple ingredients make them easy to digest. Can I give my dog Charlee Bears instead of food? Although our treat is all natural and wholesome it was not formulated as a complete diet and should not be used as a food replacement on a regular basis. How many calories are in each treat? Each Charlee Bear Treat weighs less than 1g and is less than 3 calories. A typical medium size dog biscuit has 36 calories. This means that you can give your dog 12 Charlee Bear Treats and still be giving fewer calories than if you gave 1 medium size dog biscuit. 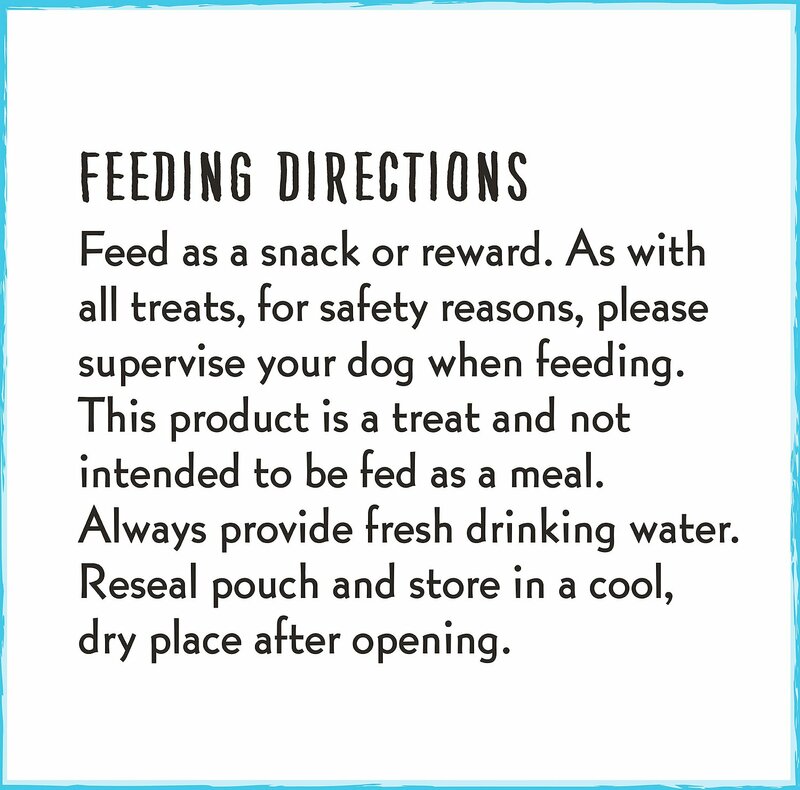 What kind of dog is on the package? The dog on the package was Zach and he was a Charlee Bear Dog, a type of mixed breed that was bred in the 1990's. He weighed around 50 lbs. He helped start our business and came to all meetings. He was the company inspiration and still is our symbol. Do Charlee Bear treats contain garlic? Do Charlee Bear treats contain salt and sodium? Our original treats have salt added at a very low level. Salt is about 1/3 sodium. The cheese and egg are slightly higher in salt/sodium due to the naturally occurring salt in cheese. Your dog would need to eat more than 1 - half bag of ch&egg treats, more than 250 treats and over 1 full bag, around 500 treats, of the other flavors, at 1 time to ingest 1g of sodium. Do Charlee Bear Treats contain calcium, magnesium and phosphorus? Our treats are considered low in calcium and magnesium and may contain small amounts of phosphorus from liver and wheat. A rough estimate on phosphorus would be .002 grams of a 1g treat. 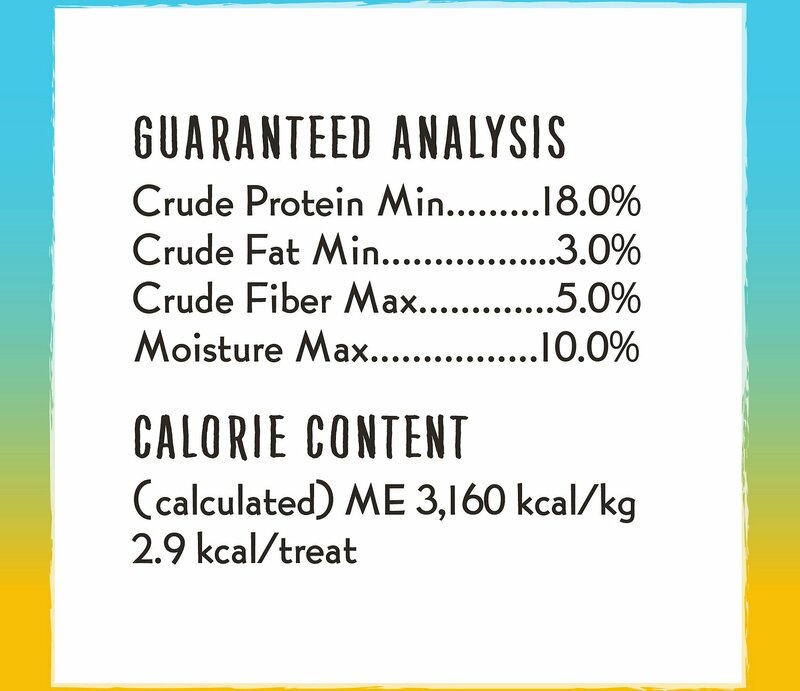 What is the fat content of Charlee Bear treats? Our treats are low in fat. Due to the small size of each treat there would be less than .05 grams of fat per treat in the Cheese&Egg Flavor and less than .03 grams of fat per treat in other flavors. A dog would need to eat 20 Cheese&Egg treats to get 1g of fat or 33 treats of any other flavor to get 1g of fat. 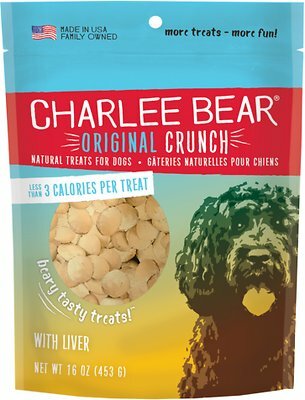 What is the protein content of Charlee Bear treats? All of our flavors are regularly tested and have a minimum level of 18% protein. Dogs love the taste of real liver, cheese and eggs in our treats and those ingredients provide a good level of protein. Perfect for a quick Good Puppy treat. These are tiny, but apparently very tasty. Both of my dogs get SO EXCITED when they hear me take the bag out of the cupboard. I use them to reward good behavior, such as, when Scout uses his potty pad, both of them get one. I wouldn't be surprised to see Daisy Mae pick up Scout and carry him to the potty pad over and over all day just so she could get a Charlie Bear. At our house we call these Mama Cookies. They are Penny's treats when she goes out and does her business, treats when she does her little tricks, etc. Penny LOVES her Mama Cookies and she highly recommends them for yummy crunchiness, low calories and ease of storage. Ever morning, Mandy--75lb. Labradoodle--goes out to chase her squirrel friends back and forth on the fence. She gets a "Charlee Bear" treat each time that she doesn't bark. Great fun for all! I have 2 Shelties and they both loved them. My 6 month old puppy loved tossing them around before eating them and the 13 year old liked the crunch. Low in calories definitely buy them again. "Charlee Bear liver treats are da bomb!". 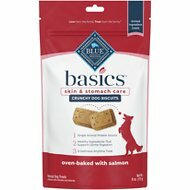 Their human like them because they are easy-to-manage training treat. No crumbling in your pocket or purse. Nice shape to give pup without nipping. I love all the Charlee Bear treats. Small enough to use for training--not too many calories per treat. We've bought several flavors of these, and although our dog likes these, this flavor isn't her favorite (or maybe we've bought too much Charlee Bear and need to switch to something new). They're crunchy, so you don't have to worry about a soft treat that gets hard if you don't seal the bag up properly. These treats are low in kcal which make them great for training. My girls loves them. I like Charlee Bear treats for my dogs because they are the perfect size and texture to be in my pocket so I can reward for them when we are walking and/or training. My cat loves them too! Our large dogs love Charlee Bears! Strange enough, one is allergic to peas, so we have to stick to the ones with grain. We like the variety; they are crazy about all the flavors! I like that they don't have a bunch of unnecessary ingredients, also. Being bite size, they can have them as rewards, but my husband gives them a few at lunchtime... "cuz they're such good boys," he says!